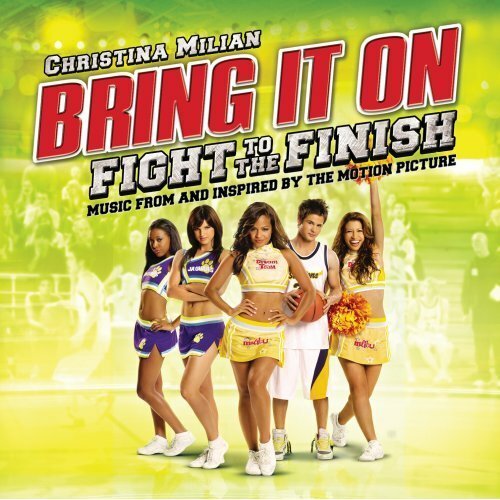 Bring it ON : Fight to the Finish starring the famous Christina Millan, the main actress. Summarize from wikepedia and my own narration. Lina Cruz[ Christina Millan] is a tough, sharp-witted cheerleader from East L.A. who transfers to Malibu Vista High School after her widowed mother remarries a wealthy man. Lina not only finds herself a fish-out-of-water at her new high school, she also faces off against Avery, the snobbish and ultra-competitive All-Star cheerleading Captain who leads her own squad, ‘The Jaguars’ after the high school squad, ‘The Sea Lions’, did not vote for her to be Captain. After Lina upsets Sky, her stepsister, she is forced to join The Sea Lions. She goes into the school stadium to check them out and finds Evan, a basketball player who is also her crush, practicing hoops. He is also Avery’s younger brother. Lina impresses Evan, and The Sea Lions vote her Captain. When Lina is Captain, Gloria, her friend from East L.A, is called to help her out. After a team member from the Sea Lions quits, Lina calls her other friend, Trey, to come and help her out. At a basketball game, the Sea Lions go on and perform, but a fall takes place, so The Jaguars, led by Avery, are there and save them from their misery. Lina calls for back up and takes the Sea Lions to an impromptu flavour school to work on their movements. She later meets Evan waiting for her there, and Victor, Gloria’s boyfriend, befriends him. The next day, Lina comes up with the idea of The Sea Lions competing in the All Star Championship. After the team agrees to double up their practices, The Sea Lions are invited to a Rodeo Drive Divas (RDD) party. Following Sea Lion practice, Gloria and Trey are expelled when Avery goes to the principal and gets Lina in trouble for sneaking them in without approval. Lina refuses to go to the dance but is confronted by Sky. Evan takes Lina as his date to the party, where Gloria and Trey turn up. Lina and Avery proceed to have a dance off. Lina wins the dance off, and Avery tells her that she does not belong in Malibu using multiple racial slurs. Lina, angered, runs off the dance floor and outside, where Evan follows her. There she breaks up with Evan, sends for Gloria to take her back to East L.A, and quits being Captain of The Sea Lions. There, Lina is confronted by Gloria and Trey, so she stays at Malibu and becomes Captain of The Sea Lions again. The next day at school, half of the Sea Lions squad quits because of Lina’s routines and practices. Avery and Kayla approach Lina, Christina, and Sky to tell them that they are dreaming if they think they have a chance at winning the Spirit Championship. Sky loses her temper and tells them to back off, otherwise a fight would start. Lina then goes on a field trip to East L.A with the remaining Sea Lions, where Gloria has persuaded a gym to sponsor the Sea Lions and some of the members of The East L.A.Rough Riders as an All Star squad. By combining the Sea Lions and the Rough Riders, they become The Dream Team. The ending ? You got to watch it. My rating is 10 stars for these highly family entertainment. Watch the youtube trailer.